So UK Immigration Minister Mark Harper has said that a mandatory ID card scheme is under consideration in the UK for “Romanians, Bulgarians and other Europeans” according to The Guardian. This immediately set alarm bells ringing in my mind, as EU citizens should be treated the same way as ‘locals’. This is of course the latest in a series of comments by UK ministers upping the fears of migration to the UK from Romania and Bulgaria when transition controls are lifted at the end of this year. So what can be made of this latest idea? First of all, there is no way such an ID system can be made compulsory for Romanians and Bulgarians, and not for other EU nationals. Article 46 of the Treaty on the Functioning of the European Union (full text PDF here) commits Member States to abolishing any administrative procedures restricting the freedom of movement of workers, so if Romanians and Bulgarians faced more onerous procedures than others, that would be unlawful. So it’s IDs for ALL EU citizens, or for none. But what about the distinction between British citizens and other EU citizens? According to Directive 2004/38/EC (PDF here) Member States may issue registration certificates to EU citizens resident for more than 3 months – as stipulated in Article 8 of the Directive. Importantly this certificate can require financial means to be demonstrated, but “this amount shall not be higher than the threshold below which nationals of the host Member State become eligible for social assistance” (i.e. the minimum wage). So the UK could – legally – oblige all EU citizens to obtain such a document. But the question then arises: what good is such a document actually going to do anyway? Because more or less everything in the UK functions for British citizens without ID. Is a NHS A&E going to turn away a Frenchman without such a certificate with them, while they will not turn away a Brit who does not have a certificate in the first place and cannot even prove they are British (as only a passport can prove a Brit is British)? The Guardian piece cites a Spanish example, where EU citizens are obliged to register, but fails to note that Spain has a compulsory ID card system – for Spanish too. The real problem here is not with the EU, but with the UK, as people resident in the UK have no simple way of proving their identity, whether they are UK citizens or not. In Denmark, my entitlement to healthcare – as a Brit resident here – is the same as a Dane’s, because we all have a CPR Number that gives us entitlement, and allows the health system to check our records. The only way for the UK to adequately check entitlement of a Romanian or a Bulgarian, would be to institute a system to be able to check French and Spanish and Brits too. And that is not going to happen. The fact that UK citizens have to register with the carabinieri or get a SOFI-nommer or whatever in these other countries is a violation of the supposed free movement of peoples. I don’t care if it’s applied in a non-discriminatory fashion to all residents: it’s not necessary to have these systems; they increase the cost of moving to a job in a different country, and they should be done away with. If Europhiles were serious, they’d propose an international treaty or European directive, compelling signatory states to abolish their identity management systems, ID cards systems, and registration requirements. I believe there was an immigration system in past…. I believe Mr. Hitler created similar system…. All people ( even Jewish ) were very happy as this was showing who is should claim for benefits or not…. finally it was showing who is German…. We know how it ended…. I can only congratulate Mr. Cameron fantastic idea…. Now I know how second category human being feel like…. even if it`s just an idea…. I would going to say the same thing as Sue. But with a difference: the NIE registration with the local authority has been in place for many, many years. However, in 2007 Spain imposed the obligation of EU nationals registering with the Central Government. At the time I felt quite uncomfortable with that situation and when the obligation came into force in 2007 the queues in Barcelona were beyond belief! 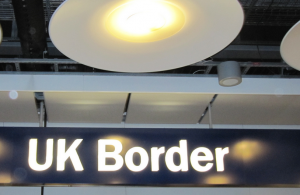 A few years down the line I am more comfortable with Governments knowing exactly the number of EU nationals living in their borders (UK nationals are already controlled via passports and National Insurance numbers for example). So, getting EU nationals to register is nothing new. The difference being the UK Government has considered ID cards as inappropriate for nationals and a waste of money, whereas Spain has national ID cards, thus avoiding the whole discrimination issue. Of course, it may also lead to a significant increase in EU citizens applying for UK citizenship, which will defeat the purpose of avoiding tabloid headlines……. As a foreigner, when you arrive in Spain you are expected to register at the local town hall, mainly because of central funding. If you get pulled up by the police, that’s one of the things they’ll ask for if you are a resident. Other than that, the NIE Card is deemed as identification (you cannot get medical treatment, work, electricity supply, rent accommodation or a bank account without this). This is obtained at main Police Stations where a comprehensive form about family, nationality, last home addresses, photos and finger printing are required to be completed before you finally get it. You are also not entitled to any benefits whatsoever unless you have worked and paid into the system for a year. It would be relatively simple to use our existing NI numbers, adding a few fields to the database to hold the same sort of information. It needn’t be too intrusive and let’s be real here, this is going to happen eventually anyway. The power crazed EU will stop at nothing to barcode, chip and trace the masses. NHS – both the GP and A&E etc already routinely ask fro proof of residence if they suspect you are a foreigner. So do the banks, if you want to open a bank account. Basically, the idea, while in my opinion is immoral, cynical and disgusting, IS actually workable. Assuming they want to avoid the headlines in tabloids “so many migrants came in last year” etc etc – all they have to do is to introduce the ID for EU citizens. Since the passport office is self financing (and thus passports are expensive) make the same provision for IDs. It will be a minor irritation to the West Europeans, but will simply price a LOT of Romanians and Bulgarians out. Next – understaff the ID unit, so that it takes months and months to actually get the ID (like they do with work and residency permits already) – and hey presto – no headlines before the elections…. If they want to avoid a broohaha – they can always stipulate that the 2,5 million EU citizens already here will a)be first in line, and b)get it for free. Disgusting – yes. Workable – also yes. While the registration scheme is allowed under EU law (but they cannot be issued with something called an “ID card”, which they only get from their member state of nationality), there is no practical purpose for which the government can make it obligatory to produce such a “certificate” without discriminating between EU citizens. However, the aim would surely be to encourage request for and production of the certificate to smooth a range of transactions, both official and private. After all, if you’ve paid £55 for your card you’re going to want to get something from it. It would be ironic if such a card made it easier for non-Brits to prove their identity/address than Brits. As for health treatment (as opposed to social security benefits), being able to prove residence in the UK should have the effect of facilitating (non-emergency) treatment. Those entitled to job-seekers allowance will have a paper trail to justify that anyway. Methgnks you are spot on with this. Another Government initiative designed to grab a headline, and fight off UKIP destined to the filing cabinet when anybody with an iota of understanding EU rules gets hold of it. Always wonder if ministers know all of the above and are just speaking incorrectly to get strategic press coverage. Or are these issues so subtle that HO lawyers can’t quickly pick them up/ rule on them? @Rahul – I wonder. I think there is some genuine misunderstanding here, especially as concerns how these systems work in other EU countries. But I think – as Gawain says – this is 90% done for headline grabbing purposes. There is also the cost issue here – if you were to try to do this, the cost would be enormous, and surely outweigh the benefit (if there were to be any). @Tommy – You – currently – sign up at a doctor’s surgery with 2 utility bills. You do not have to prove nationality to rent a place to live, or pay utility firms. Are you going to place ID requirements on landlords or phone/water/electricity companies? Benefits – yes. So if there is *already* a check on that, this new registration system will not change anything. This isn’t strictly true. People have NHS numbers, they need to be registered with a GP before they can see them. If you turn up at a hospital they’ll need to find your records somehow. We already bill NHS treatment for EU tourists back to their respective countries, right? The same applies for benefits. You have to prove your identity in order to claim them.